The water levels are incredibly low. Just as depressing is the site of a boarded up White Lion at Lock 39. At least Bluebells Ice Cream shop should be open. Cross bridge 132 to the other tow path and water makes a welcome reappearance as you pass long term moorings and the entrance to the Aylesbury Arm. Cross to the other side again at bridge 131 and there are now boats on both sides nestling beneath Marsworth church. Just off the canal at bridge 130 is the Red Lion which generally receives excellent reviews. After passing Locks 38 and 37 you are into undemanding countryside taking in the Dunstable and District Boat Club up to Cooks Wharf, then Pitstone Wharf where you can hire a boat or have a cup of tea while watching boats. You then pass under the West Coast main line and the canal straightens to Seabrook Locks 36 and 35. The derelict pumping stations were used to conserve and put water back into the canal. 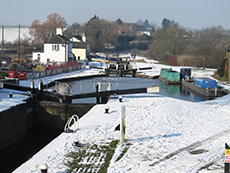 There are attractive moorings the other side of Lock 34 and the canal looks down on the surrounding flat countryside with the Dunstable Downs supplying an attractive backdrop. Moorings continue up to Ivinghoe Lock 33 which clearly has a hidden past with what looks like the remains of a canal that is now a vegetable garden, and an extra arch on the adjacent bridge. After Ivinghoe Lock 32, the bridge next to Horton Lock 31, which has attractive cottages on either side, also has an extra arch. Pass a winding hole and bridge 120 to reach Slapton moorings and Slapton Lock 30. Nothing much happens for a while after Slapton. The views are ok, the walking is easy, there’s background noise from the A488 and you hope there is something around the corner to get the pulse racing but there isn’t. If you need a diversion take the Public Footpath from near Whaddon Farm after bridge 119 where the canal bends sharply right. When you reach the road, take a right and left and you’ll reach Bridego Bridge – the scene of the Great Train Robbery. Grove Church, at Lock 29, which used to be the smallest church in Bucks, is now a private house, notable for reputedly having a human skeleton under a glass panel in the sitting room. The view from bridge 116 where you cross to the other side is pretty good except that it gives you the queasy feeling that Leighton Buzzard is getting uncomfortably close. You soon reach Grove Lock Marina, the Grove Lock pub and Grove Lock with the A505 ahead and increasing traffic noise. When the towpath turns to gravel topped tarmac, and the first graffiti appears, you know that something urban is about to happen. The towpath is now between the canal and the River Ouzel which has in fact been running parallel to the canal for some time and this affinity will last until Milton Keynes. To brighten the mood there is a ramshackle boat yard on the left. It’s probably worth a visit to just see what type of person would run a place that is so corporately out of sync. There are also tramway tracks on the towpath that come out of an adjoining field and go nowhere. Presumably they did at one time. You are now several feet above the river and nearby lake, passing a few boats and, after bridge 115A, some neat houses that take advantage of their canalside location. The houses turn into blocks of flats as you approach the town centre. 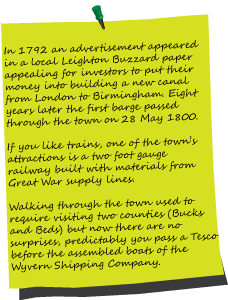 After Leighton Linslade moorings there’s a bridge which has no use as Brantom's Dock (1801) has been filled in. The surrounding area is strewn with rubbish and has the archaic feel of somewhere that was once an important trading centre from the beginning of the Grand Junction. The houses become more scattered towards Leighton Lock where the canal has dropped 126ft through 19 locks from Tring. You now swing left to an old metal bridge. Trees line the route and the country sounds and smells are enhanced by the odour emanating from an adjacent sewage works. Before bridge 111 there’s the welcome sight of The Globe Inn. The railway that kisses the canal further on, looks down from a giant embankment. It disturbs the tranquillity from time to time. This is easy walking and the canal turns it back on the railway and continues to a winding hole by bridge 110, ophidian and remaining very peaceful. You hear the occasional dog barking, see the odd walker, hear a few birds singing but nothing really occurs until the Three Locks at Soulbury where you can make good use of bridge 107 to access the Grand Union pub. The extra arch is the remains of an 1838 widening plan to duplicate the first 23 locks north of the Tring Summit. This was not a success and today this is one of various bits of evidence still evident up to Stoke Bruerne. Nearby Slapton has the best remains of a duplicate narrow lock chamber next to Lock 30. Originally a farmhouse and stables, and it was only after the canal was built that it was converted to an inn in 1830 to serve passing trade. The Post Office train had run every night, without interference, for 125 years until it was brought to a halt by a red light courtesy of an Ever Ready battery at 03.15 on 8 August 1963. Most of the 75 mail sorters working on the train were unaware that the thieves had uncoupled the engine and front two carriages of the train and drove them up to Bridego Bridge. There the gang unloaded £2.6m and made off to a nearby farmhouse where, after using real money, they left fingerprints all over a monopoly set. Most, but probably not all, the participants were subsequently arrested and jailed.